Prayer is a fundamental skill for any Christian to learn, and we want to reinforce it in our classrooms in a fun and memorable way. Use games you create from our Children's Worship Bulletins to emphasize prayer to your preschool and elementary students. Easily search our library for a bulletin about prayer and choose the one that most closely matches your lesson material. Divide the class into teams of 2 or 3 students per team. Never use more than 3 on a team because it becomes too difficult for them to see the puzzle and work together. It is often a good idea to pair an older child with a younger one. Give the following directions, "When I say 'GO', read from the top down and begin to fill in the boxes with the missing letters. For example, the first box is a P to complete the word HAPPY. Some boxes could have more than one answer as you spell from top to bottom. Use the one that will help you spell a word with the boxes going across. Let me know when your team is done. I will come and check your answers. Everyone keep working until I announce that someone has the right answers. The first team to get the right answers wins a prize." Start the class out on their team challenge. Once you have a clear winner and have rewarded them, use this opportunity to talk about the benefits of prayer that were discovered in the completed puzzles. Take time to pray with your class about any prayer requests they may have. Use extra time to work on other puzzles in the bulletin or have the class do them at home. Encourage your preschoolers to pray for each other with this puzzle turned into a game. Post your enlarged puzzles on the wall, bulletin board, or whiteboard where everyone can see them. Give these directions, "I am going to divide you into 2 teams. Each team will have a few minutes to try to find the 5 things that are wrong with the picture of Elijah praying. Use your crayons to color the things that are wrong. Don't color anything else — just the things that shouldn't be there. Raise your hand when you have 5 things colored." Divide the children into teams of evenly matched skills. Put some older and some younger on each team. Give each child a crayon to use on the poster so one child doesn't get to do all the coloring. Give each child a bulletin so they can look closely at the puzzle. Yell, "GO," and let the fun begin. Watch as your students' blossom and come out of their shells. See them interact with each other as they look for the answers. Treat everyone with the prizes provided at the end and use the opportunity to talk about Elijah's prayer and to pray with your class. Encourage the students to use extra class time to complete other puzzles in the bulletin or to finish them at home. Get your ideas for Sunday school games about prayer and many other topics by using Children's Worship Bulletins. With two levels available: ages 3-6 and ages 7-12, we have a wide variety of activities to meet the needs of your children. appropriate activities that are faithful to the Scriptures. bulletins that coordinate with your Bible study. searching our database for the specific Scripture that you want is easy by topic or Scripture reference. Download as many bulletins as you may need from the website. 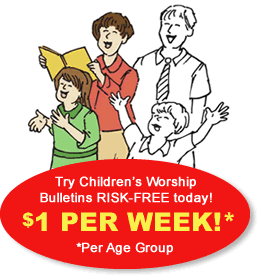 Either age group of Children's Worship Bulletins is only $4.99 per month. Or, you can receive BOTH age versions for only $7.49 a month when you choose electronic delivery. Your second age version is half price! "If at any time you're dissatisfied with Children's Worship Bulletins for any reason, we'll cheerfully issue a prompt and full refund — no questions asked."